Filled with love and tenderness, this "Ages of Women - Klimt" tapestry is a detail from Gustav Klimt's original work "Mother and Child". Here we see the mother and child in a deep embrace, symbolising protective love, as opposed to his other works representing ecstatic love of women, by this red haired femme fatale. Klimt was a pre-eminent leader of the Viennese Secession and Art Nouveau movements as he developed his style beyond that of his peers and created a style that is distinctive indeed. The details are exquisite as we see the hallmarks of Klimt's works, including the florid use of pattern and color to produce an ecstasy of color and energy taken as some to represent the human aura during love and passion. Here her hair is decorated with color as her surrounds, including the start of the child's shawl. The golden background is typical of his works in his golden era where he portrays women in roles of power, passion and in this case, sweet tenderness. 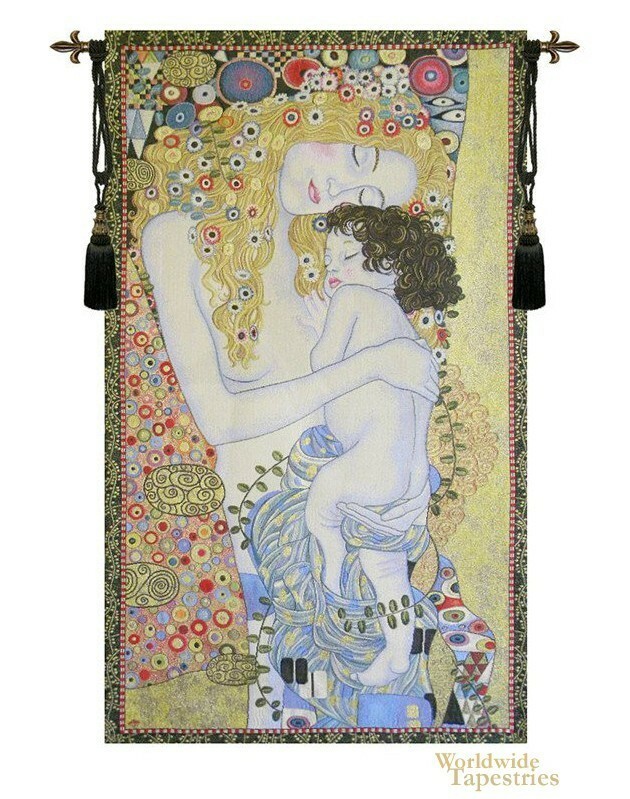 This modern art tapestry "Ages of Women - Klimt" is backed with a lining and has a tunnel for easy hanging. Note: tapestry rod and tassels, where pictured, are not included. Dimensions: W 24" x H 44"